What defines a great business class experience? The answer: pretty much everything. The seat, the service, the food, the entertainment and the overall cabin vibe must play together in perfect harmony to leave a customer satisfied. Is Cathay Pacific satisfying? You bet. Cathay Pacific operates some of the most well renowned lounges around the world, with clever design elements from the likes of Ilse Crawford. In Hong Kong, where your flight will inevitably depart or terminate, there’s nothing more enjoyable than lounge hopping between The Pier, The Wing, The Bridge, all scattered across Hong Kong International Terminal 1. In London Heathrow, where this particular flight departed, the Cathay Pacific London Heathrow T3 Lounge is also fantastic, offering both a business and first class section, with the latter accessible by Oneworld Emerald and First Class passengers. Excited for departure, I made my way to the far end of Heathrow Terminal 3, where all Cathay Pacific flights depart. Do allow a solid 5-10 mins to get there from the lounge. The airline does a fantastic job organizing the boarding process, with ropes separating each group very clearly. Within minutes I was on board, and making my way through the always enviable first class section into business class. The Cathay Pacific Boeing 777-300ER was one of the first reverse herringbone style seats created, and has been the benchmark for over 10 years. It may not be new, but it’s brilliant. The padding is on point, the screen is well sized and the seat storage is very good, particularly at eye level . Window seats naturally face toward the window, and if you can snag a seat in rows 11 or 12, you’ll be treated to the coveted “mini cabin” of business class. This cabin offers just two rows, similar to first class and always effectively guarantees very personal service and easy access to the facilities. Unlike my dreadful American Airlines flight where I didn’t receive so much as a hello before take off, I received two welcome greetings within 5 minutes of boarding. The fantastic crew member working the mini cabin personally introduced herself to each guest and made charming small talk. Cathay Pacific goes to great lengths to recognise all Oneworld Emerald members, and as such, the cabin service director (the big boss on any given flight) came over to also ensure my comfort and satisfaction throughout the flight and make equally kind and well natured small talk. This gesture from Cathay Pacific is the scourge of many other airlines, who fail to recognize even their own elite guests. I felt the love and we weren’t even yet in the air. Positive feelings, tick. The seat offered a personal water bottle, wired headphones, a vanity mirror and personal amenity kit from Seventy Eight Percent, a brand which brings together Japanese fabrics and Italian leather. An added benefit of this particular seat in Row 11 is the bulkhead, which offers a wider foot well than many seats and perhaps even an extra couple of inches as well. At somewhere around 6’3” I slept for nearly 8 hours without any fuss. 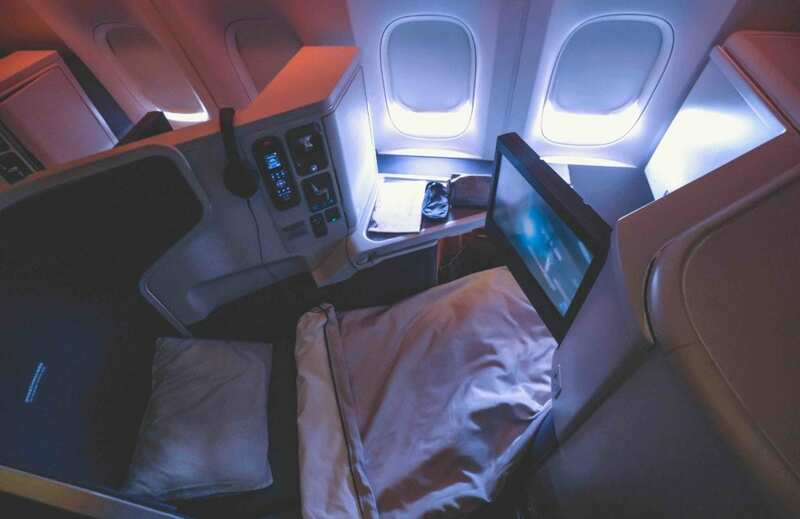 When it comes to sleep quality, Cathay Pacific does so much right, but there are a few areas which could definitely improve. There’s no obvious mattress topper, so you’re effectively sleeping directly on the seat. Fortunately, it’s quite a comfy one. In terms of pillows and blankets, Cathay plays both hero and zero. On the pillow side, it’s basically a zero. The pillow is mostly useless and hardly near the top of the business class pillow rankings. You can of course request additional pillows, but that’s not really the point. On the duvet end of the game, Cathay is a hero. I’ve adored the new British Airways White Company, United Polaris and Qatar duvets, but this Cathay duvet which doubles as sheet and duvet may take the cake. I may need to update those rankings actually. You’ll love it. News flash: it’s always better to eat on the ground than in an airplane. With that said, you get hungry on a long flight. I found the catering on board to be very good and I love the new newspaper style dining concept being offered. I enjoyed a chicken roulade starter with mushrooms before nap time and the portion was more than enough to be a main course. While I avoid airplane food, even when it’s of the quality level Cathay offers, I do love a good drink to help pass the time. Cathay Pacific currently serves Deutz Brut champagne, which I’d argue is a really phenomenal house to serve in business class. It’s one of the more refreshing yet refined options out there in the non vintage world and the crisp apple and chamomile notes just seem to work in the air. As for reds and whites, Cathay Pacific was all over the place, at least on this flight. The Allan Scott Sauvignon Blanc from New Zealand is extremely good stuff, especially in business class and is a treat in the air. On the reds spectrum… sadly The Islander Shiraz or Chateau Macard were barely enjoyable, and I can’t imagine that anyone who actually wants customers to enjoy wine would have selected them. If you like a little something sweet, warm and comforting, the Hong Kong style “milk tea” is an item you simply cannot miss. It’s everything great about a good cup of black tea, with a little inimitable sweetness. Cathay’s 777 business class seat features a refreshed entertainment system which is super solid. The screen is above average in the speed department and the system controller works fairly logically with good scroll speeds. I tucked into some classic Frasier, then Raiders Of the Lost Ark and then finished up with some newer HBO hits. On a 12 hour flight, this level of entertainment cannot be under appreciated and Cathay has done a phenomenal job. What a great way to travel! Excellent sleep quality, crisp Champagne, refined service and enough entertainment to keep you busy for days made for such a pleasant impression. There’s no privacy door anywhere to be found in Cathay Pacific business class, but in the mini cabin of the Boeing 777 I felt first class seclusion and a business class experience still firmly planted in the top 10.
don’t you think it’s ironic that AA charges more for flying on its own metal and poor service while partners cost less and better service. any idiot would choose the later, don’t you think? I just came back from a SFO to South East Asia trip on CX Business Class round trip (have done this multiple times) and the experience was excellent as usual. Not the shameless, garbage class service that AA frequently dishes out to its customers. I do everything I can to avoid flying AA and UA.